A rendering of the Paul I. Terasaki Budokan. 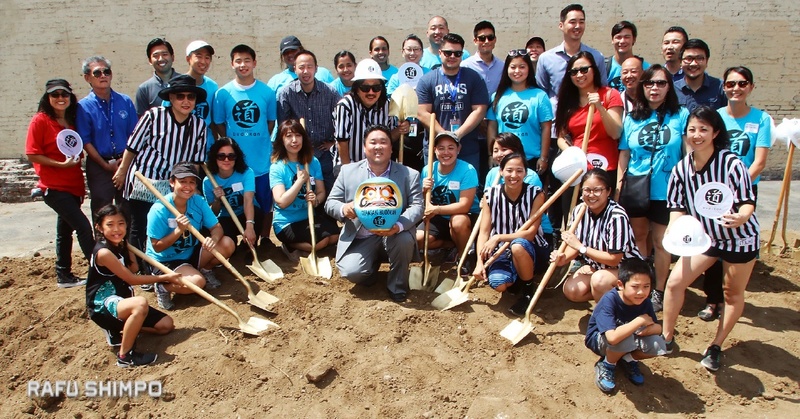 2017 was a year of giant leaps for the Little Tokyo Service Center (LTSC) campaign to build Paul I. Terasaki Budokan, a multipurpose sports and community center in downtown L.A.’s Little Tokyo. Supporters of the project saw years of hard work and generosity paying off as the campaign entered an exciting new phase. No leap was bigger than a $3.5 million gift from the Terasaki Family Foundation, in memory of renowned scientist and philanthropist Dr. Paul I. Terasaki. Announced in May, the gift provided the campaign a substantial boost at a crucial time. While the Terasaki gift was a highlight, the fundraising campaign received donations o all sizes from the community, including several hundred dollars from an 11-year-old girl who raised money by selling handmade bracelets, and checks in the thousands from an elderly resident on a fixed income and a group of high school basketball players who sponsored pick-up games as a fundraiser. Little Tokyo Service Center staff and volunteers pose for a photo at a groundbreaking ceremony for the Terasaki Budokan on Thursday in Little Tokyo. Construction on the gymnasium is set to begin in September, with completion expected at the end of 2018. By August, LTSC was ready to break ground on Terasaki Budokan. A large crowd of community supporters, funders, lenders and elected officials gathered on the future site of Budokan for the ceremony. The event featured heartfelt comments from contributors, taiko and ukulele performances and an aikido demonstration by Consul General Akira Chiba. Participants posed for pictures with hard hats and shovels to capture the moment. Other exciting stories rounded out the year. In June, friends of Budokan turned up the volume on excitement for Terasaki Budokan with second installment of “Straight Outta Little Tokyo,” a popular ’80s and ’90s hip-hop concert event. “Stars for Budokan,” a concert featuring enka (a Japanese musical genre) performers from Japan, helped to reach audiences in the Japanese-speaking sector of the community. Thanks in large part to the help of numerous sports and community organizations, LTSC held another successful Toyota Highlander raffle fundraiser. The winning family was announced in November. They received a 2018 Toyota Highlander Hybrid donated by Toyota Motors USA. For more information, visit www.terasakibudokan.org.